Denuvo's anti-piracy technology is a thorn in the side of game pirates. While it has been defeated on several occasions recently, the strict anti-piracy measures have not been without consequence. According to new research, Denuvo has frustrated pirates to a point where they sabotage reviews on Metacritic, leading to significantly lower ratings for protected games. The Denuvo anti-piracy system has been a sworn enemy of many gaming pirates for years. Early on, the anti-tampering system appeared to be unbreakable. While it’s getting cracked more easily nowadays, it’s still seen as a major roadblock. Denuvo leaves the average game pirate powerless. While they wait for crackers to find a patch, there’s little they can do, aside from bickering and complaining perhaps, which is quite common and not without consequence. According to new research published by Dr. Zike Cao of the Erasmus University’s Rotterdam School of Management, game pirates are retaliating against Denuvo-protected games by posting fake negative ratings. In a paper titled “Revenge after ‘Freebies’ Are Gone? Effects of Curbing Piracy on Online User Ratings” Cao researched the effect of Denuvo protection on user comments posted on the review site Metacritic. The results suggest that Denuvo protection leads to significantly lower ratings across the board. The researcher compared reviews of protected PC games with non-Denuvo protected console versions of the same games, showing that the former get a significantly lower rating on average. After ruling out several alternative explanations, including the suggestion that Denuvo hurts gameplay, he sees only one explanation for this finding. 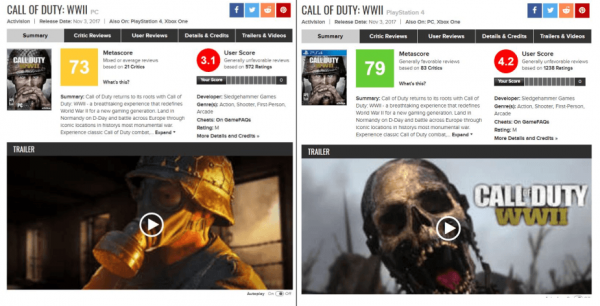 “Moreover, those retaliating illegal gamers are more likely to write textual comments along with the extremely negative ratings, but they seem to write significantly shorter than genuine reviewers do,” Cao adds. The decrease in ratings is quite substantial. The estimates suggest that a Denuvo-protected game suffers, on average, a decrease of 0.5 to 0.9 points on a ten point scale. This difference is mostly driven by extremely negative reviews, where ‘users’ rate games with a 0 or 1. This negative effect remains and is even more pronounced when reviews from professional critics (Metascores) are exactly the same for Denuvo-protected (PC) and unprotected (console) versions. “Interestingly, the estimate using the 100 titles with identical Metascores across platforms indicates the effect of Denuvo adoption is notably larger,” Cao writes. The paper suggests, following a battery of additional tests, that these ratings are purely driven by revenge. In other words, pirates who are frustrated by the fact that they can’t play the game for free because there’s no working crack available. Dr. Cao notes that this is the first empirical evidence which reveals this revenge strategy. Going forward, this may be something both developers and review sites may want to pay close attention to. “The findings thus offer digital-good providers a caveat to adopt advanced anti-piracy technologies to crack down on piracy in a hard way,” Cao writes. The full copy of Dr. CAO’s paper is available here.